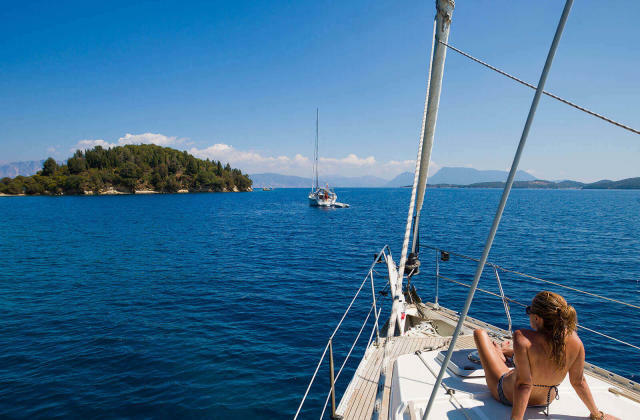 Why to sail with Ionian Charter? For our interesting and very good offers/prices! For our years experience as Yacht Charter Agent and Yacht Owners! For our carefully maintained yachts with many extras! For the security we offer to you, your sailing holidays are secured through YACHT-POOL. Why to make a security deposit insurance? What covers the charter fee as stated on the contract? Charter fee given includes the yacht rental fees for the period and ports agreed, as well as its equipment, linen & towels, fees in embarkation/disembarkation port and VAT. Charter fee doesn't include fuel consumption, water consumption, provisions, transportation from/to the yacht, port fees of the itinerary. It doesn't include what stated as "extra costs", as for example one-way fees, skipper's or hostess/cook's fee, spinnaker/blister rental etc. Why to make a charter insurance? Why not to enjoy your holidays in a relaxing way? Charter insurance ensures your payments for your sailing holidays in Greece as well as flight expenses and additional costs. Please do not hesitate to ask from our office the application form for insurance through YACHT-POOL. What is the yacht charter cancelation policy? If the yacht is rented again in the same period and under same conditions, cancelation fees will be refunded. You should bring with you clothes and personal items! Don't forget cotton trousers, t-shirts, swimming clothes, deck shoes, shorts, casual evening clothes, large sea towels, waterproof jacket. It is better to travel with soft bags instead of suitcases for storage purpose. Due to our beautiful sunny days you should not forget your sunglasses, suncream and hat! Why to hire a professional skipper? We can recommend and hire on your behalf a professional skipper for your sailing cruise. Even if you have experienced sailing, you may still require the services of a professional skipper to make your cruise more relaxing and benefit from the skippers's local knowledge. Skipper's fee per day is fix and stated on the price list, regardless of the number of people on board. Please remember that the professional skipper needs to be provided with his own cabin, as he is obliged to sleep on board. Kindly notice that skipper's are working independently and they are not part of our staff. The first payment, 50% of the charter fee, should be remitted to our bank account after booking confirmation. The balance payment (the remaining 50% of the charter fee) should be paid on the same way four weeks prior to embarkation. 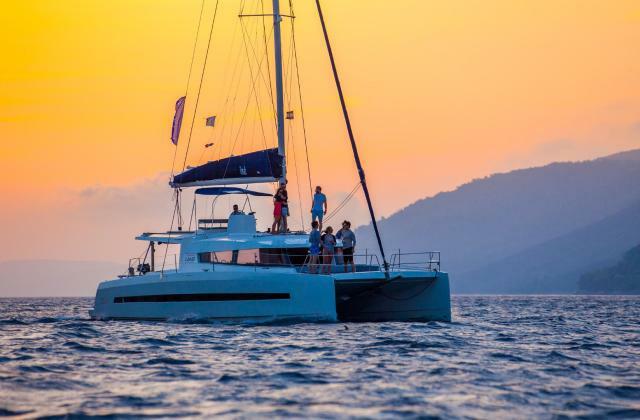 What sailing qualification are required for bareboat charter in Greece? How provisioning can be organized? In most of the yacht bases, supermarkets are in the port or in a walking distance. Supermarkets are open on Saturdays and Sundays during summertime, but in order to avoid any problems, if you are landing late on Saturday or if you just want to make things easier on your first day, we can organize your provisions in advance. You should just send us your provision list filled in before your arrival (at least one week before). What time & date is the yacht delivery? All charters begin at 17:00 on the day of departure (normally Saturdays) and typically end at 18:00 on the day of arrival (normally the Friday with final disembarkation on Saturday morning). Our base manager, with the skipper and the co skipper of the group, will start the check in procedure following the briefing of the crew from a qualified member of Ionian Charter.The charterer (skipper) of the yacht has to sign the inventory list upon embarkation, after having checked carefully the equipment of the yacht. Ionian Charter staff will give you all the useful information and instructions for a safe and pleasant trip. What time & date is the yacht redelivery? The yacht should be in the port of disembarkation latest by 18:00 on previous day of the end date of the charter (normally Friday evening). It is highly recommended that you return in the marina one day before the end of the charter so there is sufficient time to inspect and repair the boat in case of any accident before the next charter. Also early arrival will minimize the risk of having yachts returning late for check out due to unforeseen circumstances. What is the time inbetween delivery & redelivery for? Check out is starting at 18:00 in the afternoon of Friday and not later, in order to prepare the boat for the next charter. Customers should re-deliver the boat in the same condition as on delivery. In case the yacht is not re-delivered to the port of disembarkation, charges should apply to cover the transfer and petrol fees. During check out, only skipper and co skipper should be on the boat in order to check the yacht easier. All other passengers with their luggage should be out of the boat. After check out, the charterer (skipper) signs the re-delivery form and mention that everything was under their satisfaction and there are no further complains for the yacht and the staff. We require this time between charters to do the necessary cleaning/maintenance/service on the vessels.